The 2014 Warrior seniors at the annual football banquet. WILLIAMSPORT, Pa. – Seniors Craig Needhammer (Lansdale, Pa./North Penn) and Kyle Sullivan (Coatesville, Pa./Bishop Shanahan) took home the Lycoming College football team's highest honors during the 39th annual football awards banquet held at the Genetti Hotel on Saturday, Jan. 24. The team's highest honor, the Leland "Lee" Calistri '59 Award, was given to running back Needhammer. 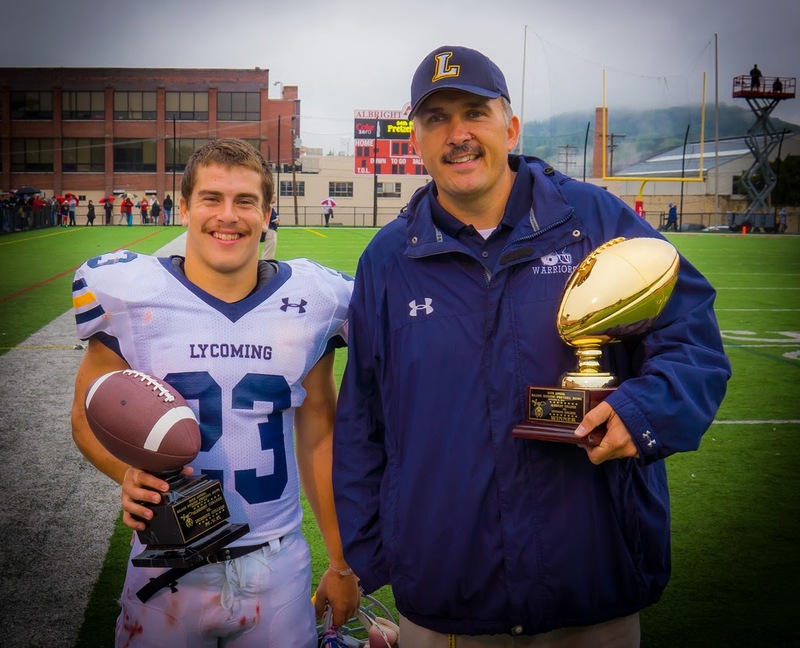 This award is presented annually to a senior, who, during his four-year career at Lycoming, placed the team's success above his own. This player displays courage, the desire to be the best he can be and a willingness to sacrifice any individual goals for the well-being of the team. The David G. Busey Award for academic and athletic achievement was presented to Needhammer and linebacker Sullivan. Needhammer, a physics major that was named a Second Team Capital One Academic All-American last week, was named to the D3football.com All-East Region second team. 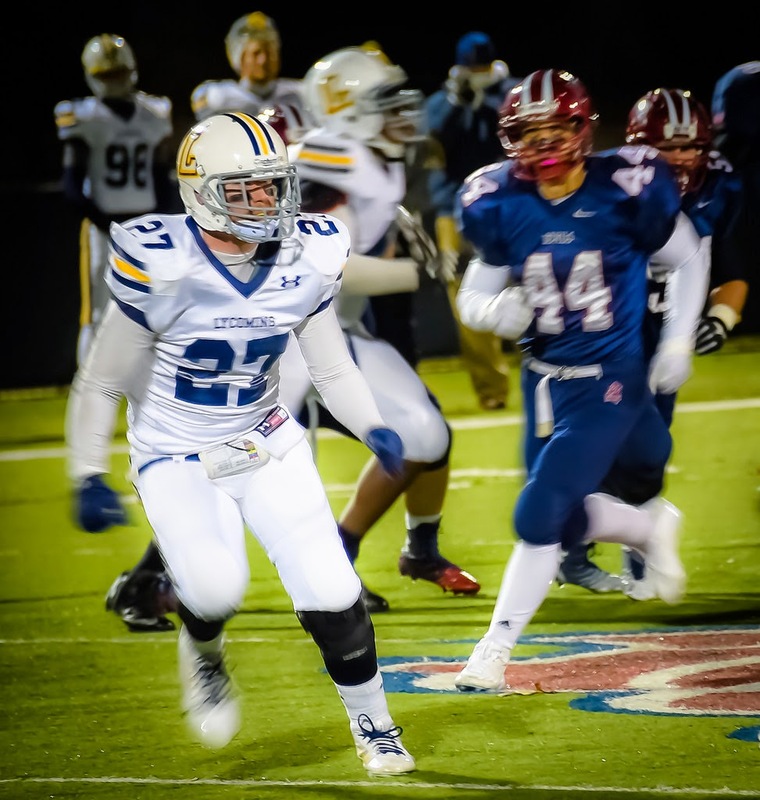 Needhammer finished third in the MAC with 1,242 rushing yards and second with 13 touchdowns. His 186.7 all-purpose yards per game led the conference and are sixth nationally. He posted the first two 300-all-purpose-yard games in program history as a senior. 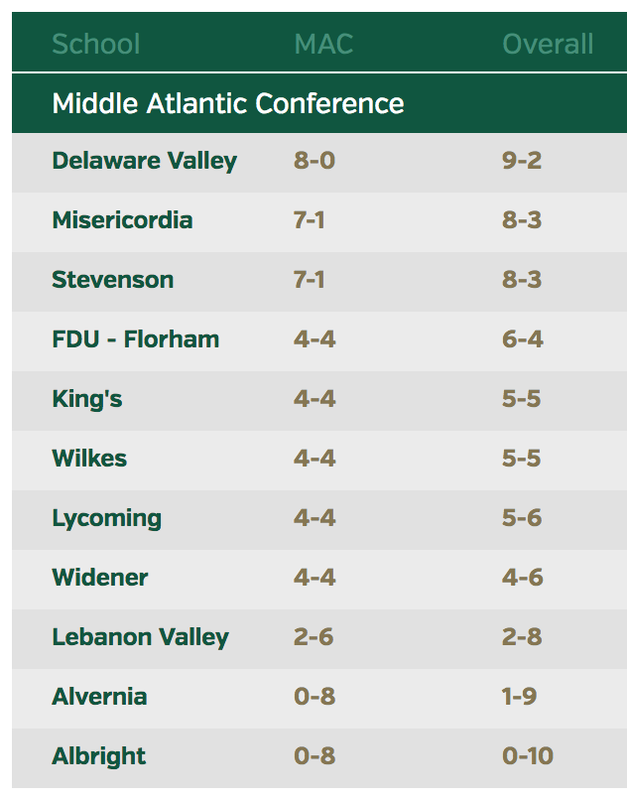 The team captain rushed for a school-record 299 yards in his last game at FDU-Florham, breaking Josh Kleinfelter's record of 3,664 career rushing yards with his final rush – that 50-yard touchdown that made it 45-27 with 2:47 remaining – giving him 3,713 career yards. Needhammer was also named the team’s Offensive Player of the Year. Sullivan, a business marketing major, picked up honorable mention all-conference honors for the second time in his career, as he finished with 51 tackles and three tackles for loss. He also notched an interception against Susquehanna and posted a career-high 13 tackles against Widener. Senior Tyler Jenny (Glasgow, Pa./Glendale) earned the team’s Most Valuable Player award. 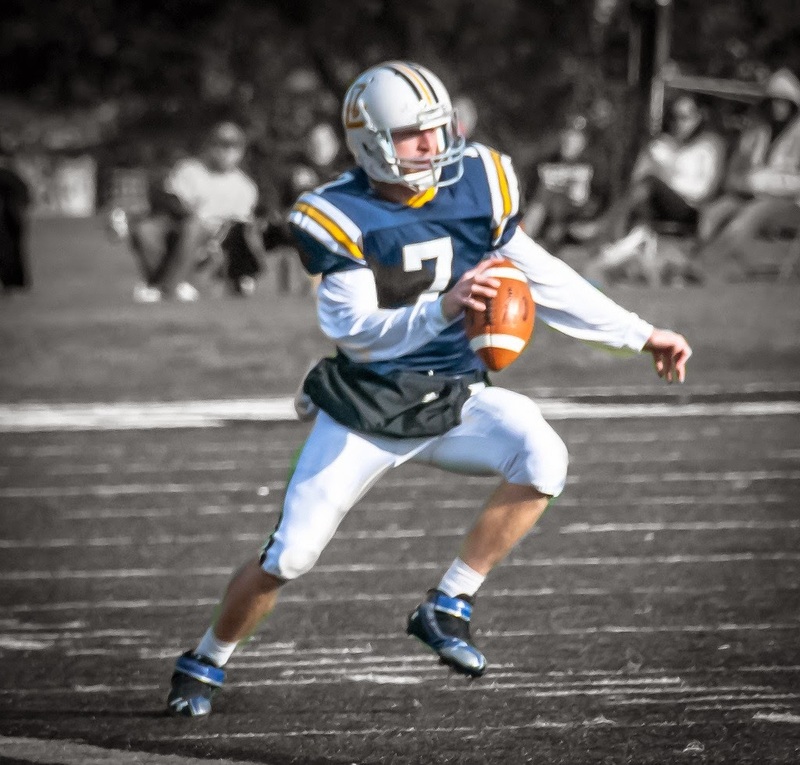 Jenny, who earned honorable mention status in 2012 and second-team honors in 2013, enjoyed his finest season with the Warriors in 2014, boasting career-best numbers across the board, with 2,404 passing yards, 24 passing touchdowns and a 155.9 passing efficiency rating. During the year, Jenny earned two MAC Offensive Player of the Week awards and was named the USA College Football Impact Player of the Week after tossing for 411 yards and four touchdowns in a 30-29 overtime win against Lebanon Valley. Junior Cole Welham (Lewistown, Pa./Lewistown Area) was named the team’s defensive player of the year. He enjoyed a breakout year as a defensive end, as the junior finished third in the MAC with eight sacks and fourth with 12.5 tackles for loss. The impact player notched 32 tackles and one breakup. He earned D3football.com Team of the Week honors after posting a career-high 10 tackles, six for loss and three sacks. Junior Ryan Umpleby (Forest Hill, Md./Fallston), while also serving as the team’s 1,000-yard wide receiver, was also a pivotally impactful player on special teams, helping him earn the Special Teams Player of the Year award. The team’s primary punt returner, he averaged nearly 10 yards a return and had two 20-yarders during the season. He also served as the team’s secondary kick returner, posting four for 75 yards. It was as the team’s punter, though, where he fulfilled a critical need for the team. Earning the job halfway through the season, he finished the year with an average of 31.6 yards on 20 kicks. He boomed a 50-yarder against Misericordia and placed five inside the 20-yard line. Sophomore Joe Smith (Willow Grove, Pa./Upper Moreland) was named the Most Improved Offensive Player. After appearing in one game as a freshman, Smith stepped into the starting lineup during preseason camp and moving from right guard to left guard throughout the season. He finished the year with nine games started and appeared in all 10. Junior Mike Gentile (Havertown, Pa./Haverford) was named the team’s Most Improved Defensive Player. He broke into the starting lineup in a big way in 2014, as the first-year starter earned second team all-conference honors after posting a team-leading four interceptions, which was good for fourth in the MAC. He earned D3football.com Team of the Week accolades after posting two picks against Albright and finished the year with 53 tackles, one for loss and five pass breakups. Senior Casey Strus (Glenolden, Pa./Cardinal O’Hara) earned the team’s Offensive Lineman of the Year award. He picked up his second all-conference accolades, moving onto the second team after earning honorable mention status as a junior. The center played nearly every meaningful snap for the Warriors this season, starting all 10 games, despite battling injuries. He helped the team average 31.6 points and 415.0 yards of total offense. Senior Zack McMenamin (Prospect Park, Pa./Interboro) was named the team’s Defensive Player of the Year after he enjoyed his finest season en route to earning his honorable mention all-conference honors. He finished the year with 50 tackles, seven for a loss and three sacks while playing out of the defensive tackle position. He also added a forced fumble against Albright.